- Can be extended with new types of input controls plug-in classes. * Manage animations that apply visual effects to the page form elements, like: fade-in, fade-out, show, hide, update content, etc..
- Load submitted form field values even with register_globals option Off and strip slashes when magic_quotes_gpc option is On. * Attachment of labels with activation keys to each form field. * Tab navigation order index. * Credit card numbers (Visa, Mastercard, American Express, Discover, Diners Club, Carte Blanche, enRoute, JCB, any of these or even determined by a select field). * Field equal to another (useful for password confirmation fields). * Field different from another (useful for reminder fields that must not be equal to the actual password). * As set (for check boxes, radio buttons and select multiple fields). * As integer number (with range limitation). * As floating point number (with range limitation). * Programmer defined client and server validation functions. - Security attack prevention by optionally discarding invalid values passed in fields that could not be edited by users but may be spoofed by attackers. - Option to define a value that, when used in a field, it is accepted without performing any of the validations defined for the field. - Ability to stop the user from submiting a form more than once inadvertdly. - Sub form validation (validate only smaller set of field depending on the submit button that was used). - Composition and generation of the form HTML output with fields displayed as fully accessible or in read-only mode. * Set the input focus to a field. * Select the text of a field. * Set the input focus and select the text of a field. What is the best PHP grid crud postgresql class? What is the best PHP youtube video downloader class? What is the best PHP responsive forms generator class? What is the best PHP AJAX file upload class? What is the best PHP tab based forms class? What is the best PHP data validation classes class? What is the best PHP multiple tabs form class? Could you suggest a good form validator? How to create related dropdown list box? What is the best PHP crud class? Include the forms class directly or use vendor/autoload.php if you install it with composer. Use the GET method if you want to see the submitted values in the form processing URL, or POST otherwise. Make the form be displayed and also processed by this script. Specify a debug output function you really want to output any programming errors. Output previously set password values. Output all validation errors at once. Text to prepend and append to the validation error messages. Define the form field properties even if they may not be displayed. Load form input values eventually from the submitted form. Empty the array that will list the values with invalid field after validation. Check if the was submitted as opposed to being displayed for the first time. Therefore we need to validate the submitted form values. It's valid, set the $doit flag variable to 1 to tell the form is ready to processed. It's invalid, set the $doit flag to 0 and encode the returned error message to escape any HTML special characters. The form is being displayed for the first time, so it is not ready to be processed and there is no error message to display. The form is ready to be processed, just output it again as read only to display the submitted values. A real form processing script usually may do something else like storing the form values in a database. If the form was not submitted or was not valid, make the page ONLOAD event give the focus to the first form field or the first invalid field. If there is at least one field with invalid values, get the name of the first field in error to make it get the input focus when the page is loaded. Make the email field get the input focus when the page is loaded if there was no previous validation error. Connect the form to the field to get the input focus when the page loads. 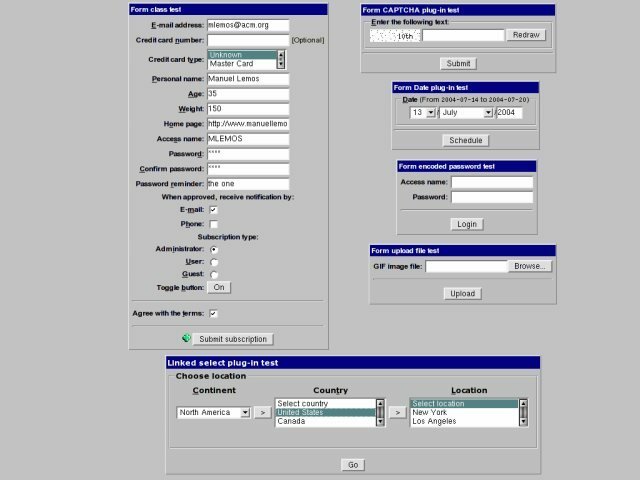 Compose the form output by including a HTML form template with PHP code interleaaved with calls to insert form input field parts in the layout HTML. Output the form using the function named Output. form_crud.php Class Custom input to handle scaffolding CRUD events by accessing data source objects. test_auto_complete.html Output Test HTML page generated by the class using test_auto_complete.php script. test_captcha_input_page.html Output Test HTML page generated by the class using test_captcha_input.php script. test_date_input_page.html Output Test HTML page generated by the class using test_date_input.php script. test_form_page.html Output Test HTML page generated by the class using test_form.html script. test_form_results_page.html Output Test HTML results page generated by the class using test_form.html script. test_linked_select_page.html Output Test HTML page generated by the class using test_linked_select_input.php script. test_upload.php Example File uploading example. .htaccess Data Apache configuration file to forbid access to all files in this directory. This file is meant mostly to force the creation Smarty compiled templates directory templates_c. Very useful class, very intelligent design. It does what it has to do. nice work, thank a lot! This is a good class!. For a beginner may be hard , but after learning its easy . A very powerful package that incorporates a lot. Support mailing list where users of this class can get help. Use preferrably the Support forum page above. Slides of a talk about the forms class, advanced plug-ins and AJAX support. The talk is in Portuguese. The documentation of this class was written in the MetaL meta-programming language. Manuel Lemos has made a 4 hour video tutorial for his popular PHP Forms Generation and Validation class..